oui, i have taken a new lover. perrier pamplemousse rose - a bubbly concoction of fragrance and bliss. after purchasing all the bottles on the shelf, i found myself searching for cases to have sent to my hOMe late last night. i may have developed a minor obsession since my first sip friday night. uh oh. above are shots from yesterday's adventure at greenfestival. jlo is rocking the 3/4 sleeve wrap dress worn backwards and lisa is rocking the leggy's, 2in1 flare top with a scarf. i'm donning the 2in1 flare top as a dress over lounge shorts (to avoid any mishaps) topped with sparkly tights, tall boots, and the long sleeve wrap tunic. i have been delighted with the amount of return shoppers from previous years who stop by to share that their TranquiliT pieces are their favorites and they receive great compliments when they wear them. a few referred to them as their "happy clothes." that's what having a clothing line is ALL about: making people feel good! oh, and an added perk, you'll never hear me say "i have nothing to wear!" 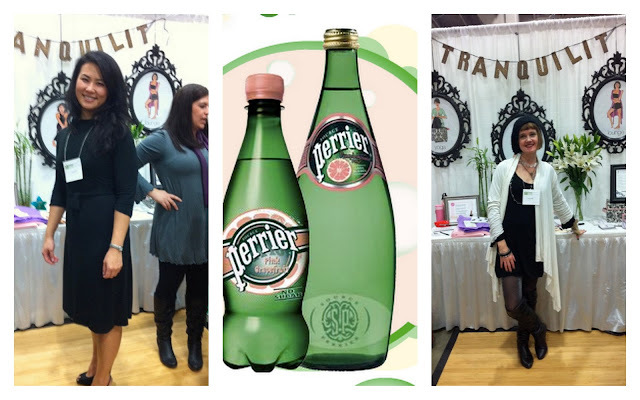 heading back to greenfestival today for more playing dress up (with 2 bottles of perrier pamplemousse rose in tow! ooh la la. photos to come throughout the day via TranquiliT's twitter. It's all your fault. I now have 10 bottles of Perrier Pamplemousse in the house. It's divine. I don't know if you have Harris Teeter's in DC, but they have Perrier Pamplemousse on sale! It is so divine. It would be nice if you could help the plus sized fans feel good too! Why don't you carry x tended sizes? Sizist? You don't seem the type. dearest redforrori, not a sizist (like that word though - most cresative). however, i do store all the inventory in tiny chez moi so i carry 4 sizes S, M, L, XL. custom orders beyond these sizes (XS or XXL+) can be crafted. see the form on the customer info page. ALL women should feel fabulous!